I’m an animal person. Some of my earliest memories were shaped by being an animal person; I spent countless hours at my grandparents’ summer cottage in Maine walking my aunt’s dogs—Roxie, Chelsea, and Cinnamon—around the property, and I would sit patiently every night to watch their neighbors’ cats—Marvin, Vanessa, Frankie, and Little—emerge from the woods, admiring both their freedom as outdoor cats and their intuitive sense about when it was time to return home. Over time I eagerly welcomed a variety of rabbits and guinea pigs into my life, always grateful to free a new fuzzy friend from a local shelter and give it a more joyful existence. When you think about animal shelters, you probably think of them as you see them in commercials on TV: rows of cages and kennels filled with heartbreakingly sad animals desperate for a good home. While most situations are not so dire, there is one animal refuge that feels more like a sanctuary than a shelter. If a cat happens to find itself homeless and in Amsterdam, there’s a chance it might find its next home on De Poezenboot, or the Catboat. If you are visiting Amsterdam, you can spend some time with the current residents of De Poezenboot and donate to an incredibly good cause. 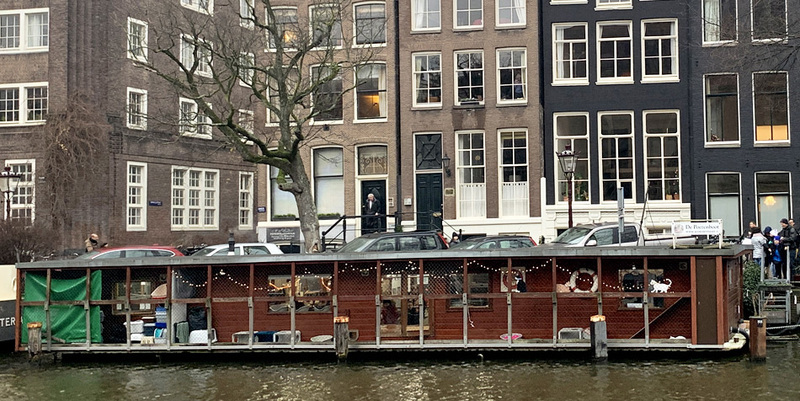 What is the Catboat of Amsterdam? 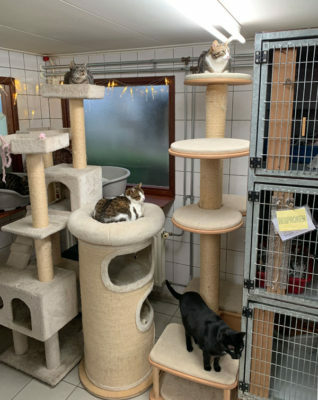 The Catboat has existed in Amsterdam for more than 50 years with one mission: to help as many cats as possible. In 1966 a woman named Henriette noticed a cat with her kittens living near her home, and she took the strays in. 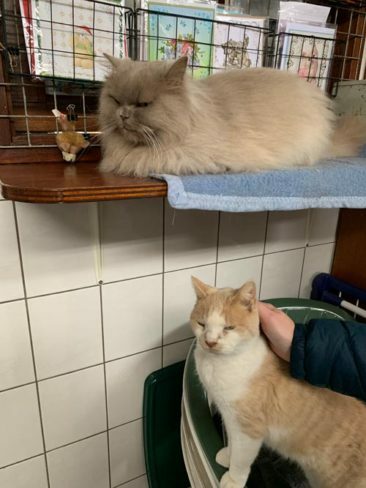 Somehow, word spread through the stray cat community that Henriette provided a nice home to those in need, and before long additional homeless cats arrived looking for shelter. Word about the unintentional cat lady spread through the human community, too; people who found strays or could not care for their own cats started bringing them to Henriette, and before long her own home was full—too full—of cats. Her solution was to purchase a houseboat in the canal across the street from her home to house the cats, and in 1968 the first Catboat opened its doors. Cats do not usually enjoy living on the water; however, Amsterdam’s cat population found it to be a perfectly suitable place to call home. Although it was intended to simply provide shelter for the cats, the concept was unique enough that people wanted to help the cause, which led to a volunteer force. A second boat was purchased in the 1970s to accommodate the steady stream of cats taking up residence, and the boat became an attraction not just for locals and visitors curious to see a boat just for cats but also people looking to adopt their next pet. Over the decades the boat has been retrofitted to meet the needs of the felines and to conform to the standards of modern animal sanctuaries. On June 3, 1987 the Catboat received recognition as an official charity, and today it remains fully sustained by donations from people who visit from around the world. The Catboat is staffed by a team of volunteers who are passionate about providing comfortable, safe accommodations to the cat population. How Can You Visit the Catboat in Amsterdam? 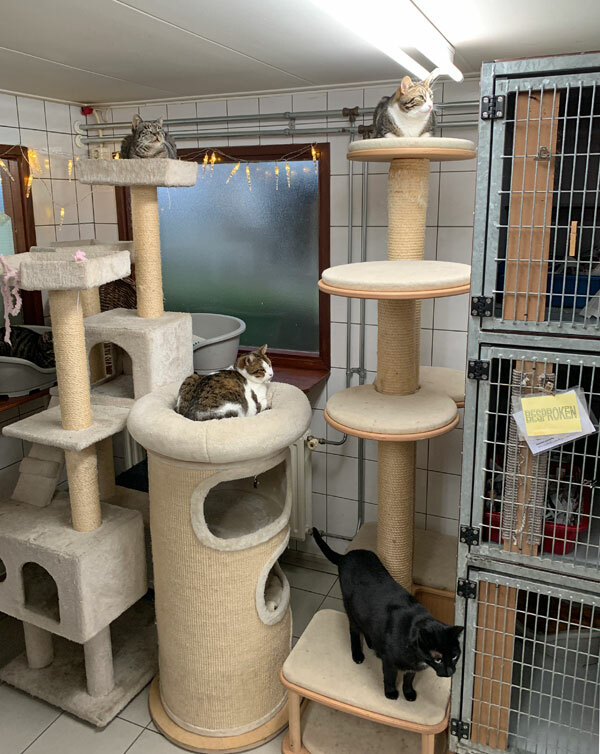 Visiting the Catboat is simple; it is less than a 10-minute walk from Amsterdam Centraal, the city’s main train station. 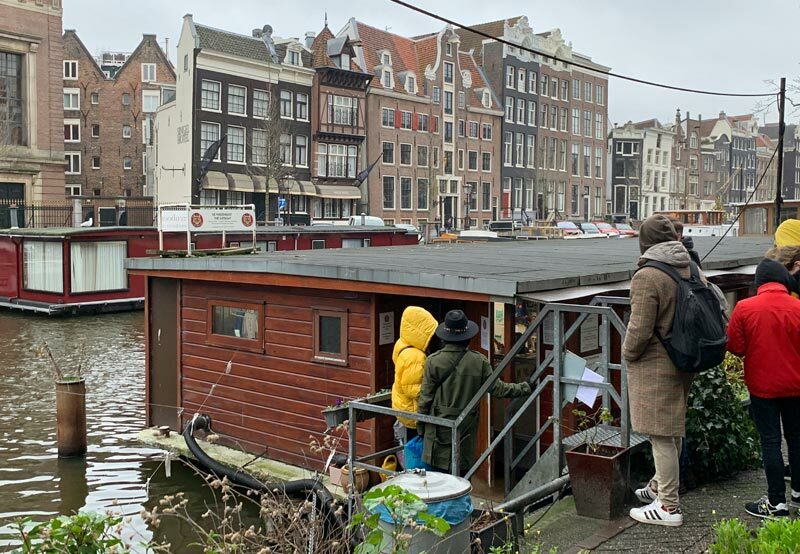 Situated on one of the canals, its serene location is a destination in itself, but the main attraction is the collection of cats inside the boat. Visiting the Catboat is free, although donations are accepted, encouraged, and highly appreciated. The Catboat is a charity and does not receive funding outside of what visitors provide, so every cent you can afford to donate goes toward the food, toys, and healthcare for every one of the hundreds of cats cared for on the Catboat. 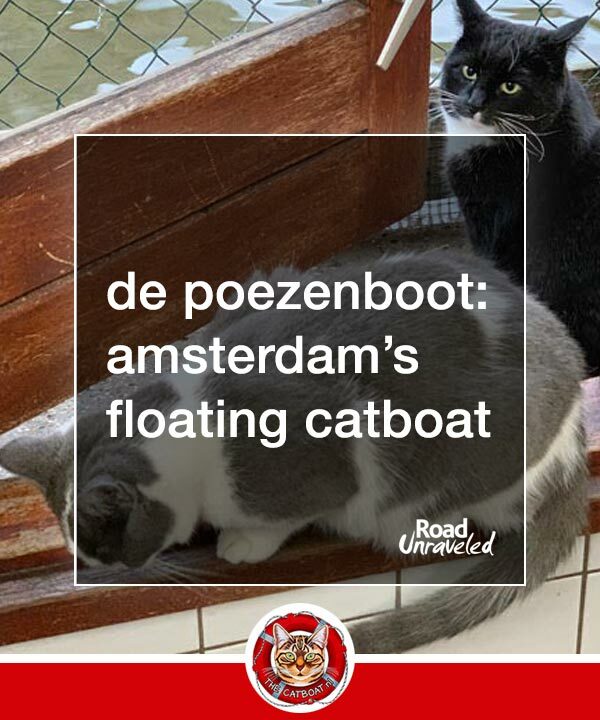 The Catboat is easy to spot when walking along the canal; in addition to the sign on the boat’s roof declaring it to be De Poezenboot with the emblematic image of a cat’s face in a circular life preserver, oftentimes there is a small line of people waiting to walk through the doors. The volunteer team is careful to regulate the number of people who may enter; while we assumed it was to ensure the cats do not become overwhelmed by the number of people trying to cuddle them at once, we were also told it is to help preserve the visitor experience and allow each person to get to know the cats better. 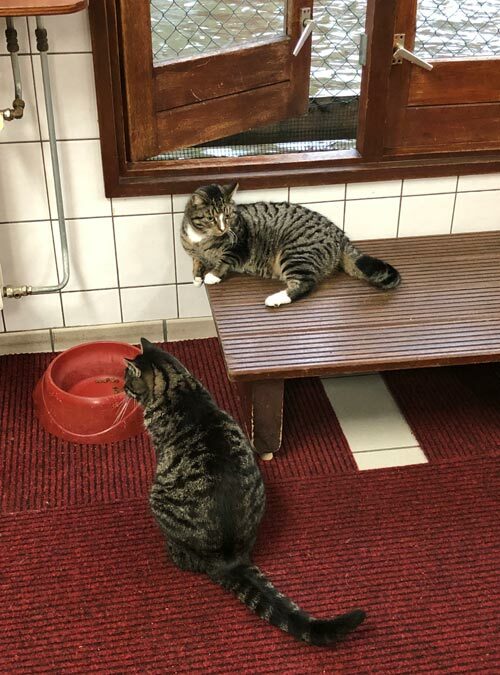 The well-being of the cats comes before the interest of their guests, so the Catboat is open for just a couple of hours most days of the week; the Catboat is open in the afternoon from 1:00 – 3:00 PM, and it is closed to visitors on Wednesday and Sundays. The cats get to spend the balance of their quiet time socializing with one another, eating, and sleeping. When we arrived, there were about 15 people in line, and the line moved fairly quickly. When it was time for us to enter one of the volunteers gave us a quick overview of our visit: guests are asked to limit their visit to no more than 15 minutes when there is a line (“But don’t rush, enjoy your time with the cats!” the volunteer assured us with a smile). With that, she opened the door and let us step into the Catboat. What Is It Like to Visit the Catboat? Visiting the Catboat was my favorite experience in Amsterdam. From the moment the door opened and I was face to face with a fluffy beige cat I was completely enamored with the concept of the floating animal sanctuary. The boat’s interior is bright and full of cozy nooks and spots to sleep or play. If cats could be architects, they would design a space for themselves that would mirror the Catboat. Our 15-minute visit gave us enough time to interact with many of the Catboat’s current residents. Most of the cats were content to sit idly by and accept pats and scratches behind the ears. Several cats, especially the younger ones, sat eagerly by a collection of toys in the hope someone might pick one up to play—and they were overjoyed when a visitor would oblige. Although it’s easy to get caught up in how amusing the cats can be, they are quick to remind you that you are visiting them in their home—and they set the rules. When the cats had enough attention they would climb to higher points where they could observe the people below or fall asleep, and a few cats excused themselves completely by letting themselves out through an open door that led to an outdoor deck. When one cat would disappear there were others ready to take its spot, especially if they might get a head pat from someone passing by! The Catboat is a tourist attraction, and its increasing popularity means more and more people are interested in visiting. It is a good idea to arrive early and be among the first people admitted to visit the Catboat to ensure you both minimize your time in line and have the opportunity to get inside. 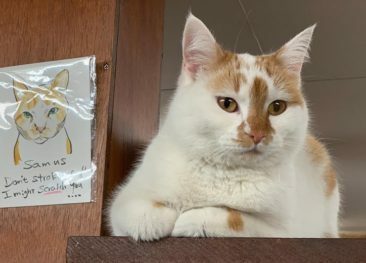 The cats who live on the Catboat are more than just a tourist attraction; they are animals with feelings and personalities. Take a few moments to let the cats get to know you as you get to know them; let them see you and smell you, and take their lead when it comes to how you interact with them. Some cats will crave affection and want to cuddle, some will accept a few pats on the head, and some may not want to engage at all. We met cats who fell into each category; one particularly memorable cat was one with a case of the sniffles who had perched himself on top of the highest point in the room. We didn’t get to play with him at all, but he still left a lasting impact on us and our visit. Be sure to respect the cats and how they want to spend time with you. The Catboat is completely run on donations from visitors who support their work, so bring some extra cash with you for the donation bin. The Catboat also offers a gift shop where you can purchase souvenirs like shirts and magnets, and the proceeds support their sanctuary efforts. Even a few Euro will go a long way. It is tempting to want to document every moment on the Catboat, but be sure to put your phone away for at least part of your visit. Find a quiet corner of the room and simply observe the cats as they engage with each other and the people who visit. We watched cats as they awoke from naps and gazed out toward the canal, valiantly defended their access to the food bowl, and challenged each other over toys and resting spots. We felt their breathing change as they drifted off to sleep as we stroked their backs. Mostly, we loved experiencing what life is like in a well-organized, well-maintained animal rescue. These moments were best lived without our phones, and you’ll be grateful for your own moments lived without a lens, too. Are you planning a visit to Amsterdam and want to see the Catboat in person? With dozens of hotels and hostels throughout the city, there is no shortage of places to stay in Amsterdam. 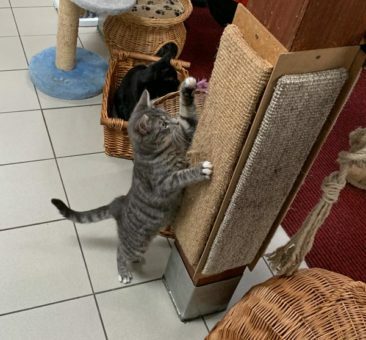 We stayed at the Holiday Inn Express Amsterdam – City Hall, which was an easy 25-minute walk (Google Maps Route) to De Poezenboot Catboat. We used Booking.com to find the hotel and that worked great for our itinerary. Here are a few more deals to consider as you research your own hotel options in Amsterdam. The Catboat is a truly wonderful animal rescue. We admired the hard work and effort that goes into running such an incredible sanctuary on a boat in an Amsterdam canal. 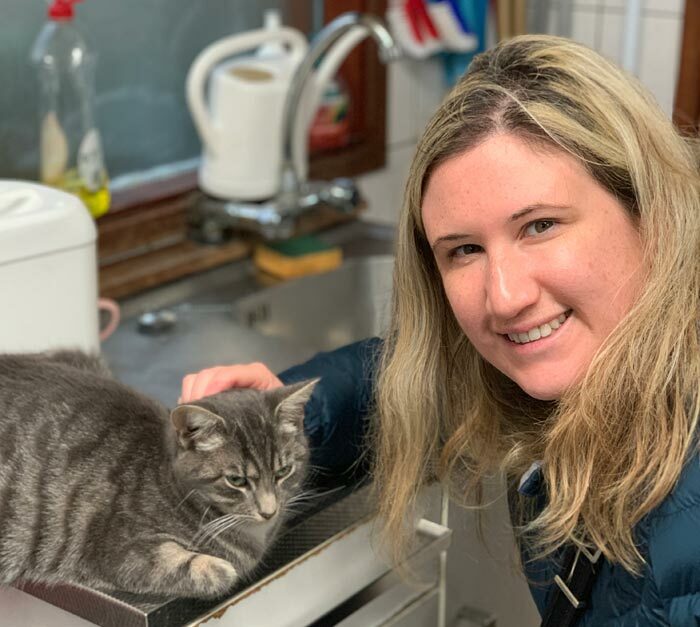 The unique concept and decades of love given by volunteers and visitors is evident in how well cared for the cats are, and we were grateful to be part of it—even for just a short time. 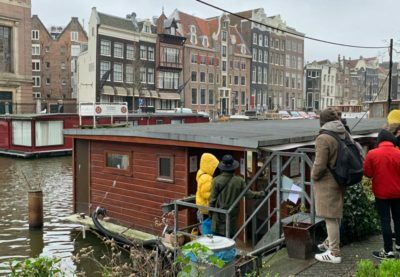 If your travels will take you through Amsterdam, and if you are an animal person or are interested in experiencing a different kind of charity, don’t miss De Poezenboot – the Catboat. It is a great way to appreciate the city’s feline population and see some of the best of humanity at work. Looking for more interesting places to visit around the world? Here are a few more posts to check out! * From time to time, our travels are directly impacted by a service or company. 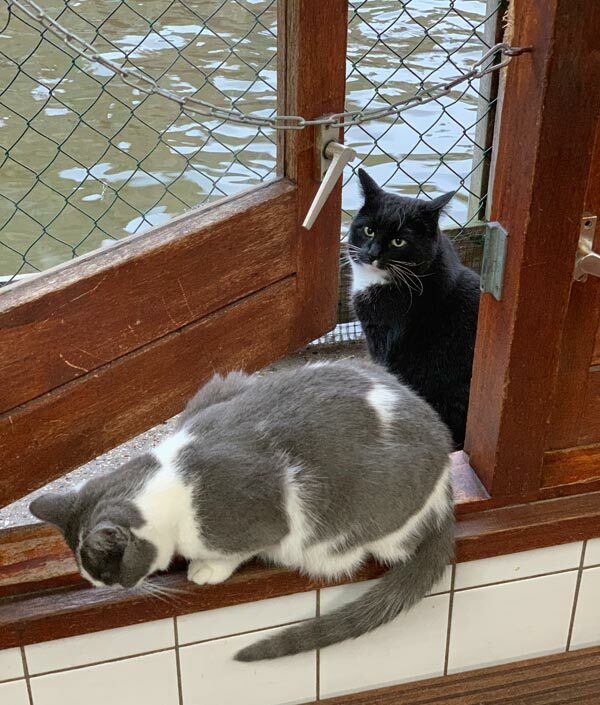 In this case, we visited De Poezenboot: Amsterdam’s Floating Catboat, and this post includes our candid review of our experience. We selected this location based on our own research and travel interests; we were not offered and did not receive compensation of any kind from them or any other party in exchange for our review. Learn more about our travel philosophy here.